Foreign Affairs Minister Chrystia Freeland says Canada isn’t backing down from its position that led to diplomatic sanction from Saudi Arabia. Foreign Affairs Minister Chrystia Freeland says Canada isn't backing down from its position that led to diplomatic sanction from Saudi Arabia. 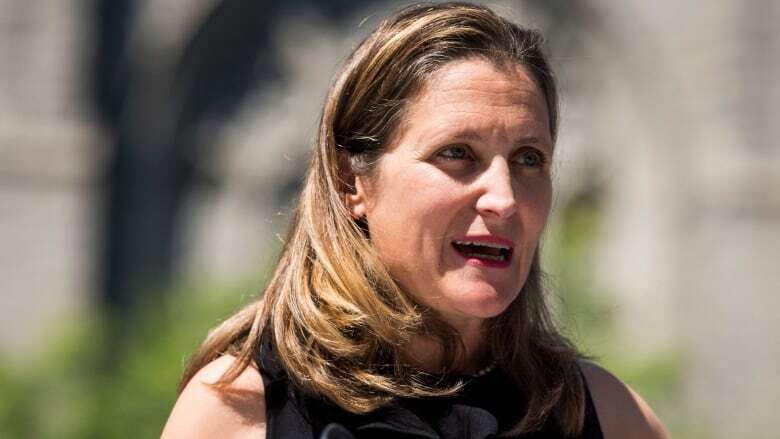 Freeland made the comments Monday afternoon in Vancouver a day after Saudi Arabia announced it would cease new trade deals with Canada and expel the Canadian ambassador. "I will say Canada is very comfortable with our position. We are always going to speak up for human rights; we're always going to speak up for women's rights; and that is not going to change," she told a news conference. "Canadians expect our foreign policy to be driven by and to embody Canadian values, and that is how we intend to continue our foreign policy." On Friday, Global Affairs Canada had tweeted, "Canada is gravely concerned about additional arrests of civil society and women's rights activists in Saudi Arabia, including Samar Badawi. We urge the Saudi authorities to immediately release them and all other peaceful human rights activists." The Saudi foreign ministry ordered Canada's ambassador, Dennis Horak, to leave the country, and called the use of "immediately release" in Canada's tweet "unfortunate, reprehensible, and unacceptable in relations between states." It also said, "Any other attempt to interfere with our internal affairs from Canada, means that we are allowed to interfere in Canada's internal affairs." Freeland said the government was still waiting for more information about the specifics of how new sanctions would impact ongoing trade agreements between the two countries. This means the fate of Canada's $15-billion arms deal, which includes providing armoured vehicles to the country, is still unknown. 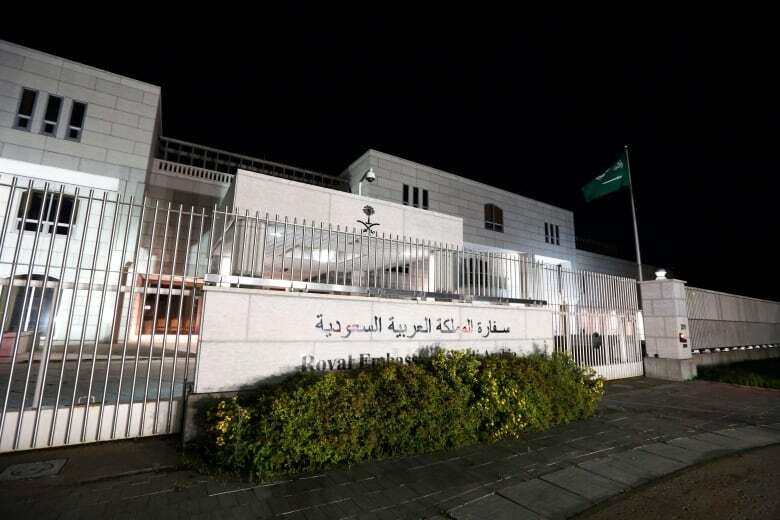 Although the Saudi government gave 24 hours for the Canadian ambassador to leave Riyadh, Freeland said the embassy remains open and consular services are still available. She wouldn't disclose Horak's location, but said he is "fine." CBC News confirmed Monday that Horak has been in Toronto on annual leave for the past three weeks. Saudi state television also reported Sunday that the Education Ministry was coming up with an "urgent plan" to move thousands of Saudi scholarship students out of Canadian schools to take classes in other countries. Horak has said there are about 16,000 Saudi students in Canada. Freeland said students from Saudi Arabia who had been accepted were still welcome at Canadian schools. "It would be a shame for those students if they were deprived of the opportunity to study here," she said. On Monday, Saudi state airline Saudia said it would suspend flights to and from Toronto as of Aug. 13. Prime Minister Justin Trudeau has not commented about Saudi Arabia's sanctions. Bessma Momani, an analyst on Middle East affairs and professor at the University of Waterloo, said the move resonates positively among Saudis, but also among the country's allies in the region. Momani called it "getting tough on Canada," which she said other countries in the region might welcome if they view Canadian foreign policy to be led by human rights concerns. There could be a sentiment among allies that, "Finally the Trudeau government is getting poked back in the eye by the Saudis." At the same time, it sends a strong message to European and Middle Eastern countries that they shouldn't "mess" with Saudi Arabia, said Thomas Juneau, a professor at the University of Ottawa. "There is a clear, uniquely Saudi dimension to this in the sense that in the last three years Saudi Arabia has been behaving very aggressively and assertively in the Middle East," he said, noting the blockade of Qatar and the war in Yemen. "For Saudi Arabia to punish Canada, it's fairly easy because we're not an important country for them, neither are they for us," he said, noting that it sends a message to others that it will not accept criticism. Amnesty International has said Samar Badawi, the sister of jailed blogger Raif Badawi, was recently detained along with Nassima al-Sada, another prominent female activist. "Ensaf is a Canadian citizen," Freeland said of Badawi's wife, Ensaf Haidar. "She and her family, therefore, merit special attention from the government of Canada and a lot of Canadian civil society has been speaking up for her." In a statement released Monday, Amnesty International called on the broader international community to follow Canada's lead and stand up for human rights abuses, especially countries with influence in Saudi Arabia such as the U.S., France and the U.K.
"The world cannot continue to look the other way as this relentless persecution of human rights defenders in Saudi Arabia continues. It is now time for other governments to join Canada in increasing the pressure on Saudi Arabia to release all prisoners of conscience immediately and unconditionally, and end the crackdown on freedom of expression in the country," the statement said. Lynn Maloof, Middle East research director for Amnesty International, said the organization is still hoping for "strong condemnation" of Saudi Arabia's actions. "We are hoping Canada is setting a precedent now and a model that would have other Western allies support with it, stand with it and support the Saudi crackdown," she said. Later Monday, a U.S. State Department official said they had asked the Saudi government for more details on the detention of activists and urged it to respect due process. It marked the first comments by Washington since the dispute erupted between Riyadh and Ottawa. "We have asked the Government of Saudi Arabia for additional information on the detention of several activists," a State Department official said in a statement, calling both Saudi Arabia and Canada "close allies." Earlier in the day, Vermont Sen. Bernie Sanders on Twitter called it an "outrageous move" and said that the U.S. should "be clear in condemning repression."